Poynt Transaction Reports now support the ability to generate transaction reports by specific Terminal User (eg clerk, server, cashier, etc). 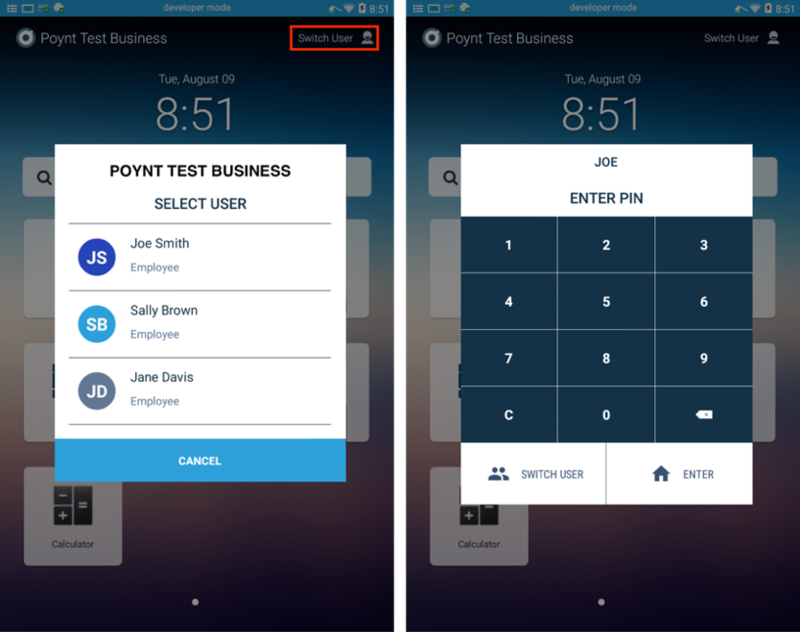 Any created “Terminal User” for the Poynt business account may be tracked and reported from Poynt.net > Reports. 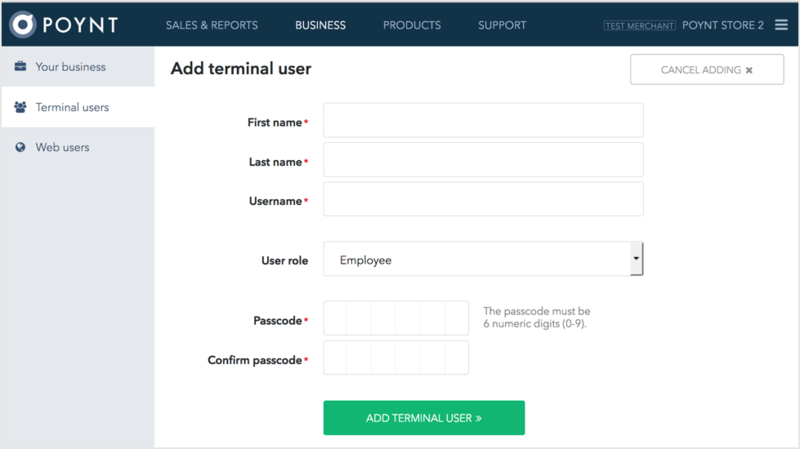 As a reminder, Terminal User logins may be created by logging in to a merchant’s poynt.net account > clicking on ‘Business’ > clicking on ‘Terminal Users’ > clicking on ‘Add Terminal User’. Enter the First / Last Name and Username of the Terminal User. Terminal Users are specifically created for those individuals who will be logging in to the Poynt terminal and processing transactions. Note: A Terminal User does not automatically have access to the merchant’s web account at poynt.net; this would be a separate ‘Web User’ account. On the Poynt Terminal, Terminal Users may switch to their user login by tapping on the ‘Switch User’ icon in the top right corner. Then enter the username passcode. Proceed with processing transactions. Instruct employees to tap ‘Switch User’ if multiple employees (server/clerk) use the same Poynt terminal. Log in to the merchant’s poynt.net account. Tap on ‘Reports’. Select to generate ‘Transactions Report’ for all/specific terminals for ‘All Employees’ or for specific employees. You will see in the Employee drop-down list a list of all of the Terminal Users for your business. Select the Date or Date Range for the report generation. Once a Transaction Report is generated, you may view the report in HTML, PDF, or Excel format. Click on the icon to view or download. Transaction Reports will indicate if the report is specific to an individual employee. If Custom Notes was entered by the merchant, this value will appear in the ID column. Excel formatted reports allow merchants to summarize or calculate specific to their own business needs. Merchants now have a quick and easy access into the Terminal App Transaction List from the new “Transactions” icon on the Home/Launcher screen. 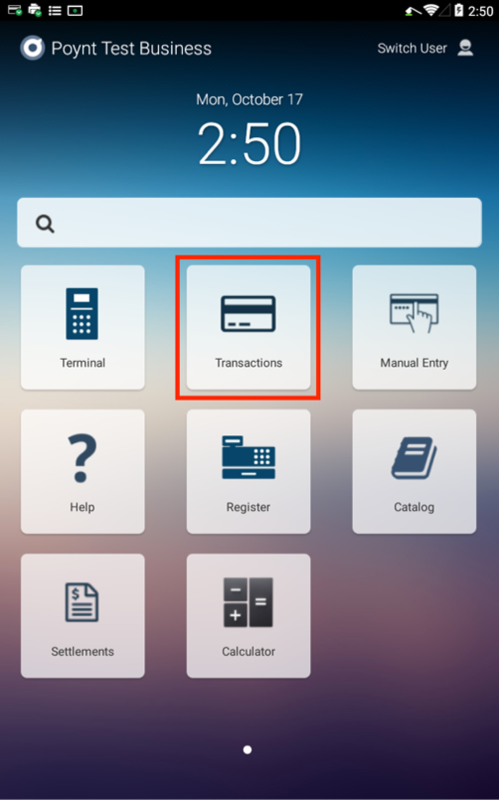 Tapping the icon will take you directly into the same Transactions List that you access through Terminal App > left side menu > Transaction List. Merchants can now see a ‘Summary’ and ‘Items’ tab on the Transaction Details pop-up when accessing the Transaction Details from Transaction List. Summary tab will display the relevant transaction summary information such as Approval Code, Sub-Total, Tip (if applicable), and Total Amount. 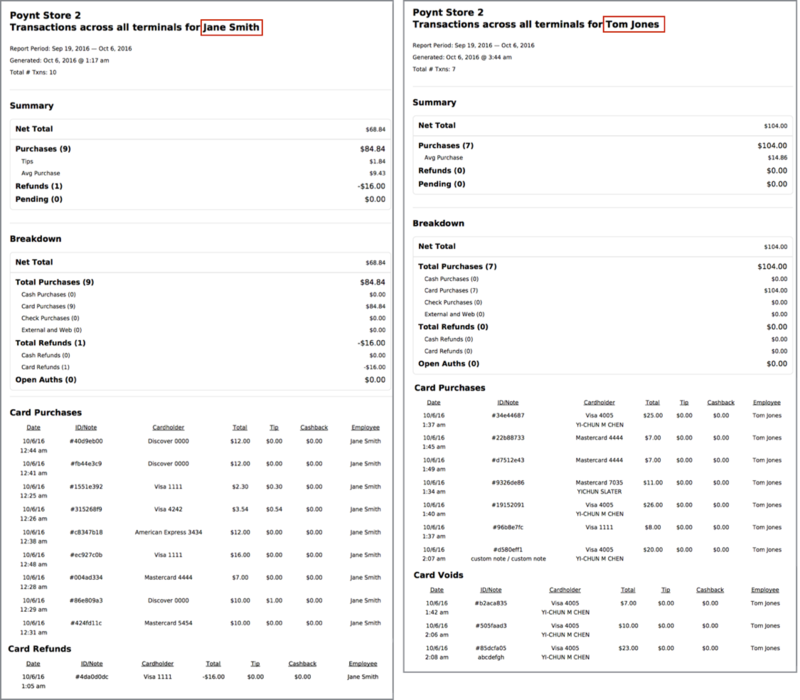 - Summary tab will include any applicable Taxes (if set in Catalog) in addition to Tip and Total. - Items tab will display product line item names, quantities, and prices. - Notes can be entered during the payment flow to be recalled later via the Transaction List > Transaction Details. 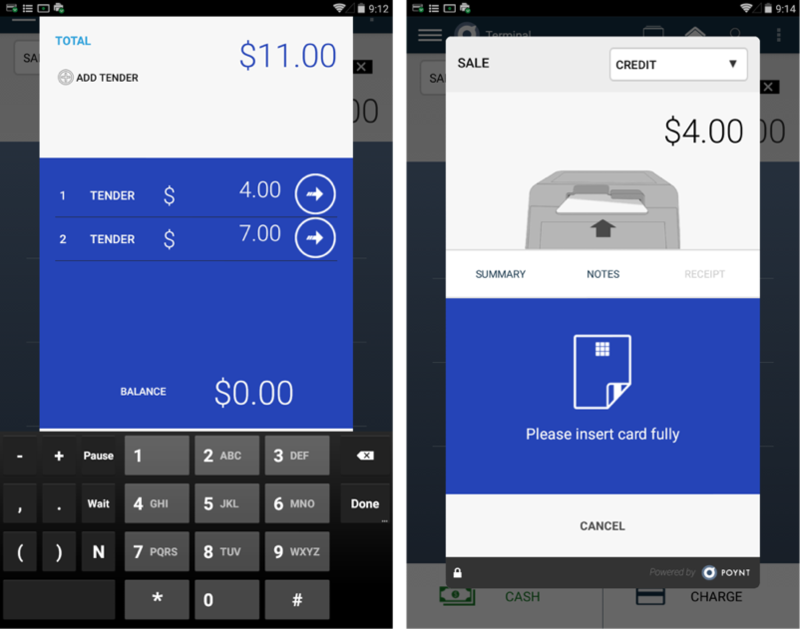 Custom-entered Notes are also printed/displayed on the customer’s receipt. - Receipt can be reprinted from the last tab. 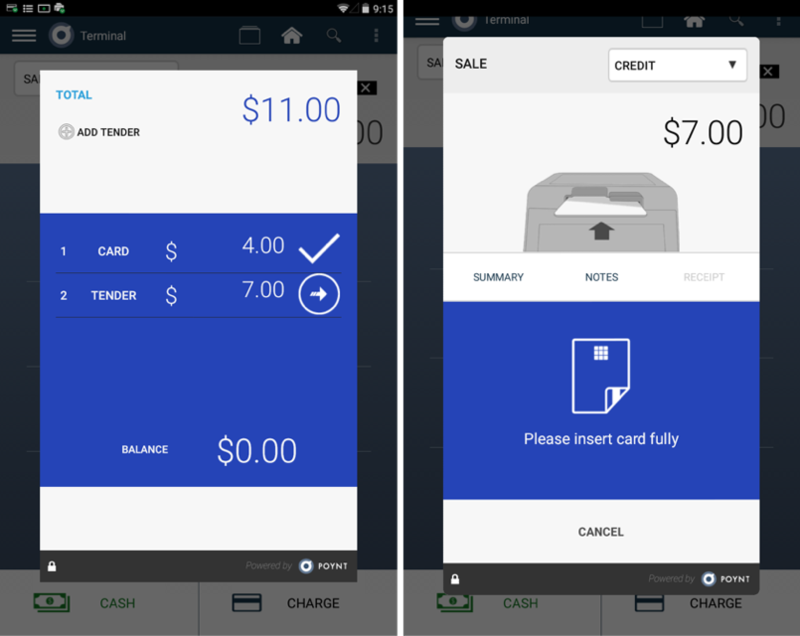 Merchants can process a transaction and split into two (or more) payments using different tenders. Examples: 1) split a payment with one charge on Visa and another charge on MC; 2) split a payment with one charge on Amex and the other as Cash payment. Start by tapping on Terminal app from the Launcher (Home) screen. Then enter in the total transaction amount. You can add additional ‘tenders’ by tapping on the “Add Tender” icon on the left side. 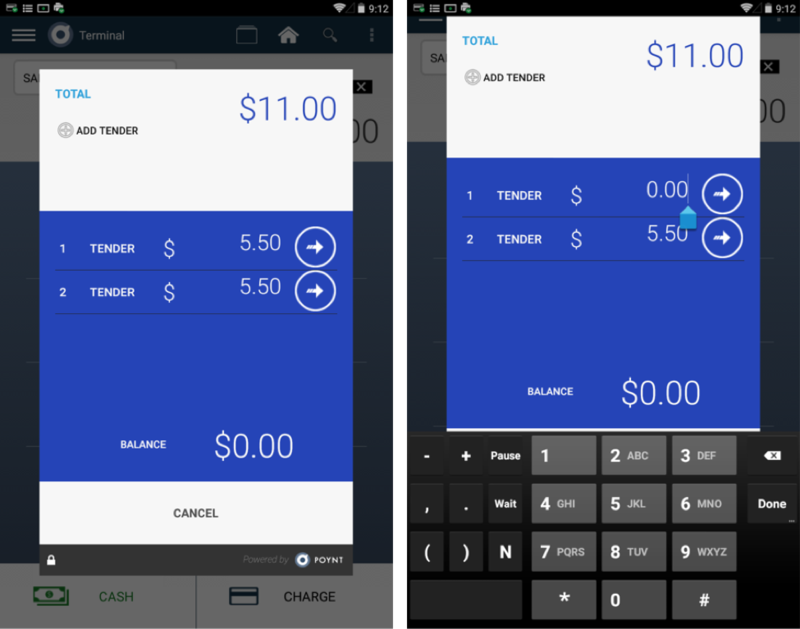 Edit Amount: Tap on the first transaction amount and the numeric keyboard will appear. Edit the amount and then ‘Done’ and then tap on the à arrow to proceed to charge that amount. If you edited the first transaction amount, after that transaction is complete, you will notice that the second transaction amount adjusted automatically to ‘make up’ the balance of the original transaction. 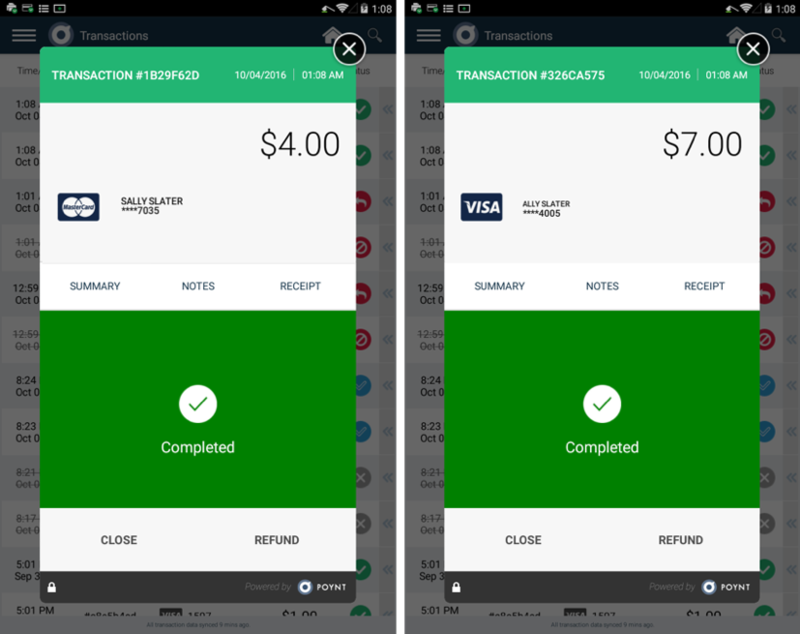 For example, if the original transaction was $11.00 and the split transaction initially adjusted to two payments of $5.50 each, then you adjust the first transaction to be $4.00, when the first transaction for $4.00 completes, you will see the second transaction updated to $7.00 ready to charge. When the payment flow completes for the first tender, then you can proceed to edit or charge the second transaction amount. 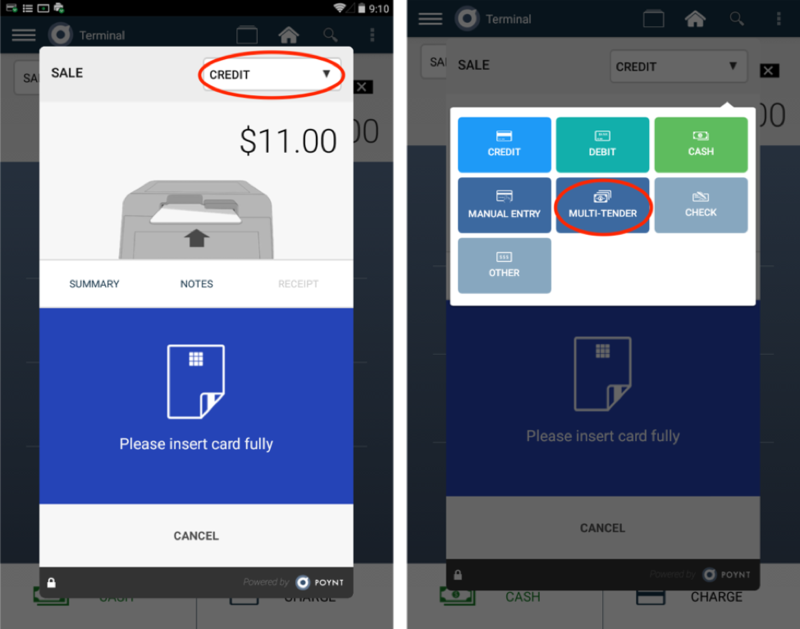 When the second transaction is completed, you will see the check icon next to it. 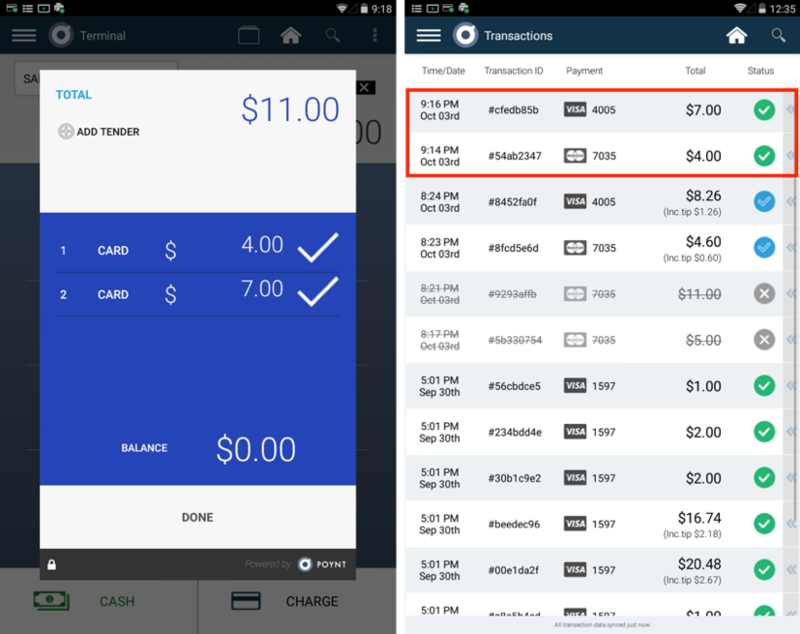 When you refer to the Transaction List, you will see the two separate transactions appear. 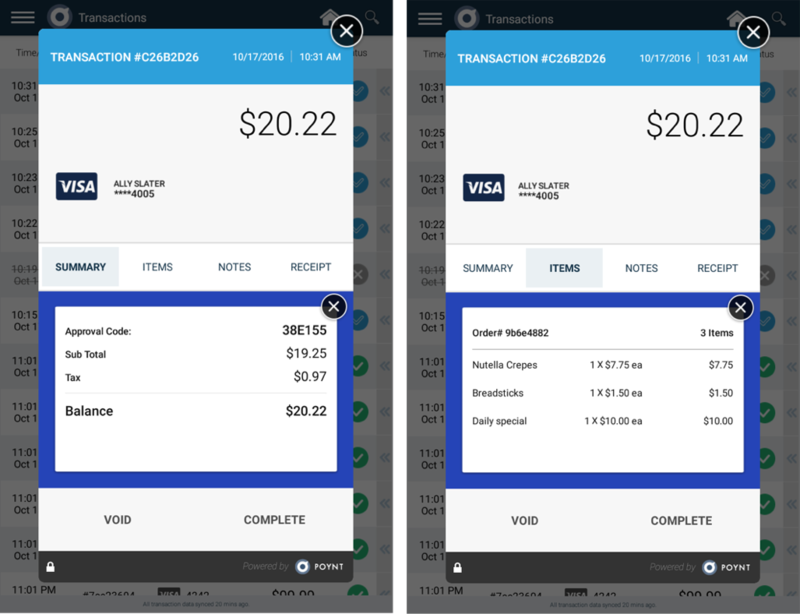 Tapping on the transaction details for each of those split transactions will display the specific details for that transaction.